Shirdi Sai Baba Stories,Leelas and Teachings. : Ram Vijaya-Chapter 50. Here is chapter-50 from the book Ram Vijaya. Readers who have missed out any chapter can read them by clicking on the link provided below this chapter . Jai Sai Ram. Rama then asked Maruti and Vibhishan to bring Sita from the Asoka forest. Whereupon they immediately went to the forest and informed her of what had happened to Ravana and said to her, " We are desired by Rama to bring you to Suvela. Please, therefore, prepare yourself to accompany us." Sita having prepared herself to accompany them, Vibhishan seated her in a *sibika [A planquin] and brought her to Suvela. She went to embrace Rama affectionately, when the latter said to her, " Do not come near me. I have set you at liberty in order that the people may not call me cruel. You have been for so many years in Lanka, and I do not know what you hava done during that time. I can not now admit you into my house; you can go wherever you like. I have no objection to it whatsoever." Hearing these words from Rama Sita was over-whelmed with grief, and replied, " I am unfortunate. For nothing you have taken trouble for me. For nothing you have given trouble to all the monkeys. If you do not like to admit me into your house, take your sword and cut off my head. I have led a pious and moral life, and I shall presently satisfy you about it." Having addressed these words to Rama, she requested all the monkeys to arrange a pile of wood and set fire to it, All the monkeys accordingly arranged a pile and set fire to it. Sita went near it and loudly exclaimed in the presence of all the monkeys and demons, " All know that I was carried off and detained by Ravana. I say that I led a pious and moral life during the time I was in the kingdom of the demon. There is the fire ready to receive me. I shall now throw myself into it; and if what I say is false, I shall be burnt in it. And if what I say is true, I shall come out of the fire unhurt. So saying Sita threw herself into the fire and disappeared for about three hours. Rama, Lakshuman, and all the monkeys grieved for her and stood near the pile bewildered. But, in the meantime, the god of fire brought her out of it, well decorated with ornaments, and gave her in charge of Rama, who heartily embraced her. Shortly after, Kama set out for Ayodya in a beautiful viman. [A chariot of the gods serving as a throne or 3,3 a conveyance through the skies, self-directed and self-moving.] Sugriva, Vibhishan, all the monkeys, and demons were seated in it. On the road Rama visited the Rishis and his other friends, who had supported him in the forest, and directly came to Nandigram, where he alighted from the viman and saw his brother, Bharat, who heartily embraced him with tears of joy. Rama then sent the viman back and stayed in the forest of Nandigram, with Sugriva, Yibhishan, all the monkeys and demons. In the meantime, Shatrughna and Sumant came to the forest with all their army and saw Rama, Lakshuman, and Sita. Kausalya, Suruitra, and Kayakayi also came there and affectionately embraced their sons. Kayakayi remembered her past conduct towards Rama and repented of what she had done to ruin him. They all then seated themselves in chariots and came to Ayodya with the acclamation of joy. On the return of Rama from Suvela all the kings on earth including his father-in-law, Janaka, saw him. 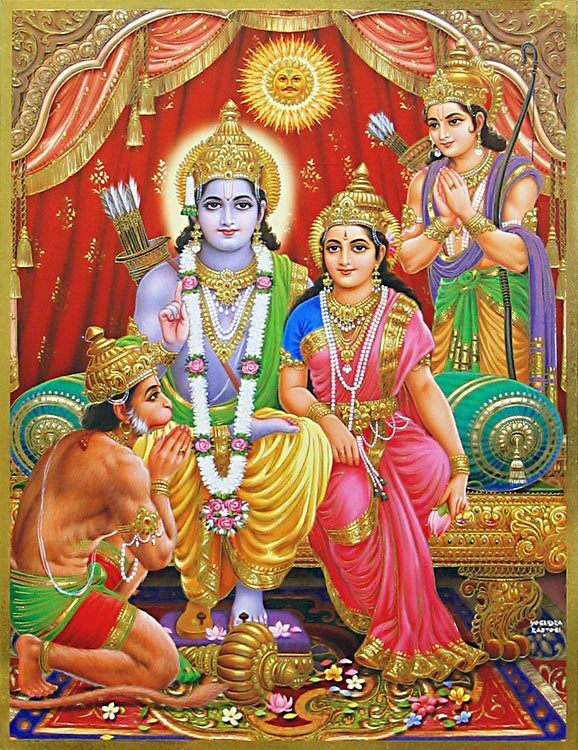 All the people of Ayodya were exceedingly glad to see Rama, Lakshuman, and Sita. Kama entertained all the kings, Rishis, demons, and monkeys for some days. Sita affectionately embraced her sister and her all relations. 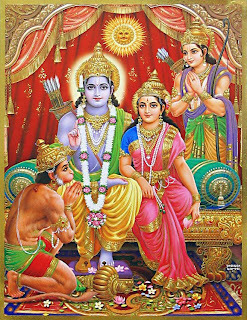 Soon after, Rama was installed by the Rishi, Vashista, in the throne of Ayodya, when all the kings paid tribute to him. Rama, the great god or paramporul, he himself had suspected pure gold sita. There is no shock when an ordinary man suspect his life partner. Being born as a human being lord Rama thrown himself to behave like an ordinary human and suspected sita.